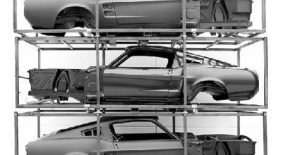 Over 100 former Unique Performance Mustang shells in various stages of production are up for auction in an effort to recoup the some $900,000 odd to the IRS after Unique Performance filed for bankruptcy. The auction, being held on March 27th, is run by Rosen Systems, a Dallas based auction house. 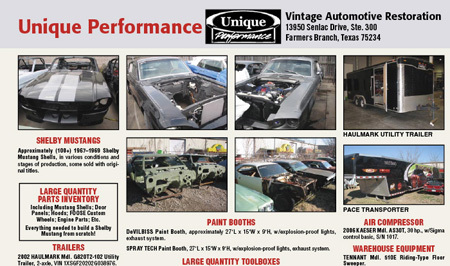 The brochure states that there are over one hundred 1967-1969 Shelby Mustang shells in “Various stages of production, some sold with original titles” along with Mustang and Camaro; Doors, Panels, Hoods, FOOSE Custom Wheels and Engine Parts. Also being sold off are various Unique Performance tools and utilities including spray-booths and trailers. So if you’re heading down to pick up a bargain remember these shells have been sitting out in the elements for a good few months. If you’re heading to the auction be sure to take some pics and send them our way. Hi Guys! I am fan the Shelby Mustang. But our fearless Leader; Carroll is in a lot of do-do… and I don’t think he’s going to get out of these. 1.) For him to watch a Gone in 60 seconds movie and then 2 years later sign to get a the Eleanor trademark for a name… what was he thinking? I hope it was one of his people that did this or told him to do this. I would hate to learn that Carroll Shelby himself want to ripped someone off. That would be wrong. 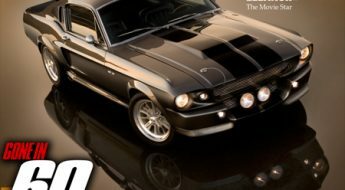 Please go to the trademark website http://www.uspto.gov/main/trademarks.htm I found out that Mr… Shelby applied for the Eleanor trademark for Automobiles before he applied for GT500 trademark for automobiles… say it isn’t so. But there it is. The Truth is the truth! Carroll Shelby didn’t have a trademark for the GT500 until 2002 that is 37 year after Ford release the 1967 Shelby GT500. I was so hurt to learn this. So all this time I thought Shelby had the he had a trademark. So I guess he was lucky that no one filed before him because he be in the same spot Denice Halicki over her late husband’s intellectual rights of Eleanor. I have to say Fearless Leader! you have hurt me and I can’t believe in you… you told us that you personal made that Eleanor for the movie. This is also a lie. All the Eleanor’s in the Gone in 60 seconds Movies where not Shelby’s cars they were just mustangs customized. That’s the truth you can call Disney or Jerry Bruckheimer office and they will tell you what they told me. 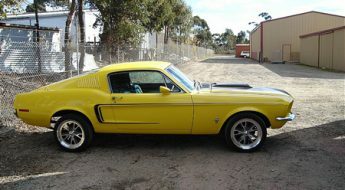 Mr.. Carroll Shelby had nothing to do with the Gone in 60 Seconds movie. 2.) NOW the Eleanor scam that Shelby’s Partners cooked up… I wish they would of stayed with Shelby’s Chile that they where cooking. Prison, Mr. Shelby? Are you kidding me. Why would you allow your partners to use Prison workers on a these Eleanor that you have your name on???? Then I went on the web and Our Fearless Leader has been using prison workers to build his Shelby cobras at decades That blows my mind, the States allow murders to build cars that a baby might be riding in… but it’s the truth. If I was one of Mr. Shelby’s customers that gave these guys 140,000-200,000 dollars for and Eleanor, I be madder-then-a-hornets nets. 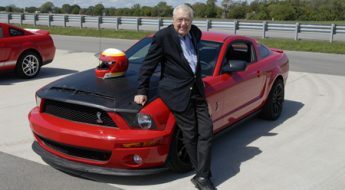 What is really sad about all this is the Buck stops with our fearless leader; Carroll Shelby. I hear they guys took 39 millions of people’s money… I would not want to be any of these guys. 3.) Last and final. 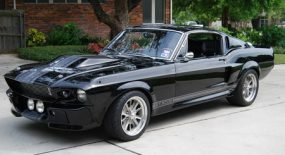 I read on the web that Shelby’s partners; Unique filed for bankruptcy after Shelby cut-bate and ran, pulling his License to his partners to build these Eleanor’s. Anyway I hear that these 30 pounds bono title-washing Eleanor’s are up for sell through an auction this month http://www.rosensystems.com/auction.php?id=47&tab=info . Why in h— would anyone what 30 pounds of bond and no title. What has this world come too? Mr.. Shelby I have always loved the 60’s Shelby Mustang (not the new ones) and the Shelby cobra… but you have mess this Eleanor thing up so bad that people or out 39 million dollars. These last years on earth are to be the time when you give back not do stuff like this… I hope you see the light in your heart to help this people that loss all that money in your business deal and give H.B. Halicki’s widow that same gift that you received by no one filing for the GT500 trademark in Automobile for over 35 years. The question that still bugs me is that you filed for Eleanor 1st then filed for GT500… your very smart you knew that without the Eleanor fame you could put out a GT500 on its own. I am still your fan. Just really Pissed off at the Man! 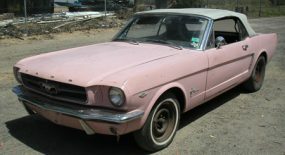 I loved the Mustang’s since I can rember. I have had and currently own a few decent muscle cars. But the one I spent some serious coin on and was to my belief going to be of real value was a 2006 pre production Foose Stallion (I purchsed the first retail car sold signed by Chip Foose himself). Now this car is now just another newer style modified mustang with a history Unique and Foose will have long wished never happened. After my 1st heart ache, (and after I dumped my deposit 2 years prior) my 2008 Shelby GT 500 Conv shows up at the dealership. 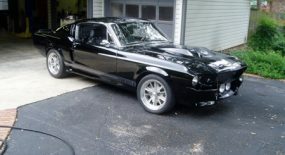 This was my child hood dream to own a Shelby GT 500 Convt. I love the car! But with all the negative media related to Unique costing fellow motor heads millions and Foose and Shelby bailing out and headed for the hills I gotta say, what the hell. I am and always have been a mustang guy. And I feel fortunate not to be one of the folks whom lost thier cash without anything to show for it. 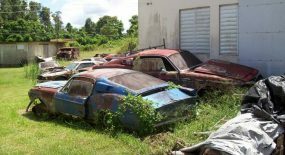 But believe me I feel like I have lost a limb, by dumping tons of cash into these “dream cars” and only after doing so do I finding out my dreams and my investments are marked as nothing more then an ugly reminder of the current dark time in mustang muscle cars. I must admit, these recent events may just be enough for me to stop my late model performance mustang preaching and find me a old beater big block anything and start over by simply enjoying the rumble, of an old muscle car with the torque and open road as my passangers and not give a second thought to these new high dollar frauds. I would love to get my hands on one of those shells. Have they been sold yet?